Antizer Flameless Candles give you all of the ambiance and realism of traditional open-flame candles without any of the usual drawbacks. Enjoy the romantic glow of flickering flames without unpleasant scents or waxy odors, or the inconvenience of wax that trickles onto surfaces. Feel free to leave Antizer Flameless Candles unattended in any room, even in the presence of children and pets, without concern that an open flame could cause burns or fires. 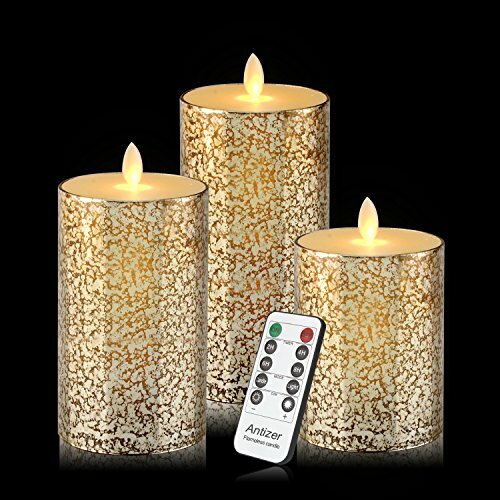 Antizer battery-operated Flameless Candles open a world of possibilities for decorating and entertaining. Our genuine top-grade glass wax pillar candles have all of the look and feel of traditional candles, all the way to their shimmering flames. Flickering Flame Technology in each LED bulb give the illusion of true, burning candles without any of the drawbacks: waxy smell, risky open flame, or candle wax marring your furniture. As a result, Antizer Flameless Candles are perfect for all decorating purposes. They are even safe to use as a nightlight for your little one. Antizer Flameless Candles can be operated by remote control from as far away as 16.4 feet, so they are perfect accents for lofty dormer windows or on the tops of your tallest bookcases. You can also schedule our candles to come on at pre-set times that you designate, and have them remain on for 2-, 4-, 6- or 8-hour spans. Whether you are settling in with a good book or opening your home to your friends and family, Antizer Flameless Candles create the ultimate peaceful and relaxing setting. Add our Antizer Flameless Candles 3-Pack to your cart today. If you have any questions about this product by Antizer, contact us by completing and submitting the form below. If you are looking for a specif part number, please include it with your message.